Jeremy Corbyn has accused the chief of the defence staff of political bias after he criticised the Labour leader's anti-nuclear stance. 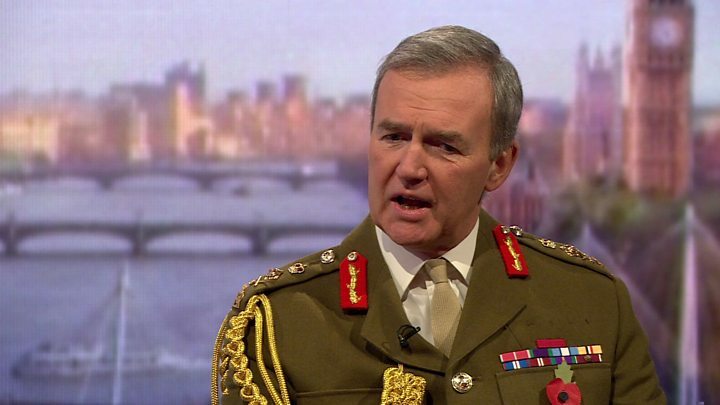 Gen Sir Nicholas Houghton told the BBC's Andrew Marr that refusing to launch nuclear weapons would "seriously undermine" Britain's "deterrent". And he said he would be worried if such a view "translated into power". Mr Corbyn called on the defence secretary to "take action" against Sir Nicholas over his comments. In a statement, the Labour leader said: "It is a matter of serious concern that the chief of the defence staff has today intervened directly in issues of political dispute. "It is essential in a democracy that the military remains politically neutral at all times. "By publicly taking sides in current political arguments, Sir Nicholas Houghton has clearly breached that constitutional principle. Accordingly, I am writing to the defence secretary to ask him to take action to ensure that the neutrality of the armed forces is upheld." Mr Corbyn, a leading member of the Campaign for Nuclear Disarmament, sparked a row with his shadow cabinet at his party's annual conference when he revealed that would never press the "nuclear button" - and he has since praised Scottish Labour's rejection of Trident. Mr Corbyn has said he was elected Labour leader on a platform of opposing Trident renewal and that he is committed to "promoting an international nuclear weapons convention which would lead to a nuclear-free world". Asked about Mr Corbyn's refusal to use nuclear weapons, Sir Nicholas said: "It would worry me if that thought was translated into power as it were." He added: "The whole thing about deterrence rests on the credibility of its use. "When people say you're never going to use the deterrent, what I say is you use the deterrent every second of every minute of every day and the purpose of the deterrent is that you don't have to use it because you successfully deter. "If a prime minister said they would never press the nuclear button, "the deterrent is then completely undermined," he added. "Most of the politicians I know understand that and I think that, dare I say, the responsibility of power is probably quite a sobering thing and you come to a realisation, 'I understand how this thing works'." Attending a wreath-laying ceremony in his Islington North constituency following the Remembrance Sunday commemorations at the Cenotaph, Mr Corbyn said Sir Nicholas's comments had been "unhelpful". "I would gently say to him, with the greatest of respect, we live in a democracy where politicians are elected to Parliament in order to take political decisions," he told Channel 4 News. "If he's worried, I think he should talk to me about it. I don't think it is appropriate for serving officers to make political comments or engage in political debate." 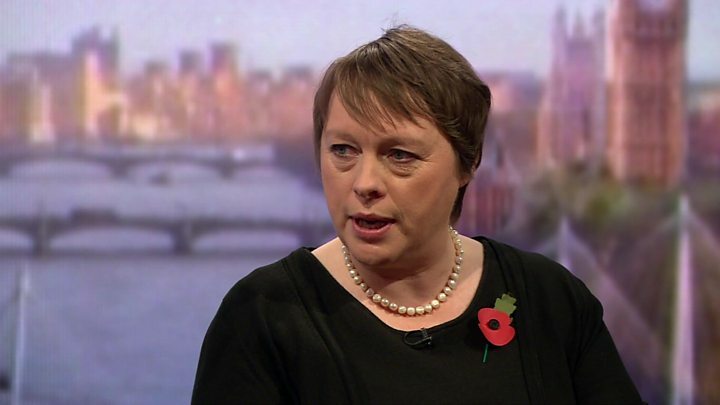 Shadow defence secretary Maria Eagle told Andrew Marr she was leading an "open-minded" review of the policy in light of Mr Corbyn's views and a vote by Scottish Labour against the renewal of Trident. She said she had yet to meet Mr Corbyn to discuss Trident but a date was in her diary. But she appeared to back Sir Nicholas, telling Andrew Marr: "I understand the point that he is making. It is the point that I made myself when Jeremy said what he said." She defended the right of Britain's most senior military figure to speak out on such a politically sensitive issue. "I don't think there is anything wrong with him expressing himself in those terms," she said. She indicated she could resign if there was any change to the party's current position in favour of renewing the Trident submarine fleet. "I am not a unilateral nuclear disarmer. I don't believe that that works. "I think I would find it difficult [to continue in the shadow cabinet] but we are not there yet. We have got a big process to go through," she said.